Manitoban artists brought home 10 awards from the inaugural Aboriginal Peoples Choice Music Awards, held over two nights at the Winnipeg Convention Centre and the MTS Centre, respectively. Country singer/songwriter and Canadian Aboriginal Music Award-winner Hank Horton picked up two trophies for Best Songwriter and Best Country CD. Juno-winning rock outfit Eagle & Hawk also won two awards, for Best Group or Duo and Best Rock CD. Another double winner was J.J. Lavallee & The Freebird Band, winning Best Fiddle CD and Best Instrumental CD. Other winners include Tracy Bone for Best Album Design, Dezmond Mentuck and D.J. St. Germain for Best Producer / Engineer, Billy Joe Green for Best Blues CD, and teenage fiddler Sierra Noble for Best Aboriginal Music by Non-Aboriginal Artist. The stunning, nationally-televised gala event took place at the MTS Centre on November 3, opened by a traditional grand-entry ceremony with hundreds of dancers in traditional dress and a large group of drummers. Over 4,000 people took in performances by 11 APCMA nominees, including homegrown talents Tracy Bone, J.C. Campbell, and Eagle & Hawk. Winners were selected by a global community of online voters between September 1 - October 13, 2006 from a total of 56 nominees in 17 categories. 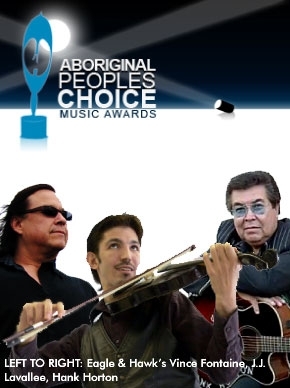 The first awards show of its kind, the APCMA’s provides an opportunity to showcase Aboriginal music to the rest of the world and to expose Aboriginal recording artists to a national fan base, music industry, and media. It is the only awards show where the fans determine the winners through online voting.